We recently stopped by Code Black for another brunch, and noticed ongoing tweaks to the menu. With so many Vs and VEs across the page, we still struggle to choose what to eat each visit. Michael had a shot at the Brunswick Ploughman's ($17.90) and learned a lesson along the way -it's listed as V, but will be served with pastourma if you don't alert the waiter that you're vego. Misunderstanding addressed, Michael still had a lot to take on: excellent flat bread, fine dips, radishes and olives, goat's cheese a salted boiled egg, some disappointingly dry chickpea fritters and other assorted vegetables. Meanwhile, I finally tested out their homemade crumpets ($16.90) - they were huge, somewhat dense and a little bland (they reminded me a bit of my homemade English muffins). I stretched the orange blossom mascarpone and berries as far as they would go, and had to give up on the last third. Code Black's a stylish venue with some good-looking food. But like St Ali North, their prices slightly outstrip our appreciation for what they do. You can read about two of our previous visits to Code Black here and here. I haven't spotted any other blog reviews since our last one. Our love of Mankoushe is no secret - we've raved about their bakery, gushed over the cafe and generally told everyone we know to swing by for a visit. So we were thrilled when a friend booked in their birthday dinner at the cafe. The staff are completely on top of dietary issues and we basically sent them off to bring us as much vegan food as we could eat. They started well with this broad bean, tahini, coriander and pumpkin seed dip, served with freshly baked bread ($9). Then came probably my favourite dish - cabbage leaves rolled with spiced rice and chickpeas ($14). I'm often a bit disappointed by soggy cabbage leaf wraps, but these were lovely - rich and filling, with plenty of flavour in the rice stuffing. The herb salad relied a bit too much on fresh tomatoes for my tastes, but the lentil salad was excellent - crispy radish giving some crunch to go with the soft lentils and the coriander and dotted pomegranate seeds providing bursts of flavour. After all that freshness, the organic pontiac potatoes, stuffed with burghal in a tomato stew, topped with pomegranate molasses ($17) were a good hearty option - saucy and delicious. The pumpkin kibe stuffed with curried potato and fresh green peas ($14) were super crisp balls of mildly spiced veggies, with a nice tomato/pomegranate relish for smearing. The last dish were these excellent potato and ginger turnovers topped with carob molasses ($14). Mankoushe Cafe really is a superbly vegan-friendly place - we were stuffed after all these dishes, unable to sample either of the two vegan pides on the menu (plus there's the felafel and all the bakery options from next door). They switch things around pretty regularly too - every time we've been in there have been exciting new dishes to try. There is not much more to say about Mankoushe - it's simply one of Brunswick's best cafes - the staff are incredibly friendly, the food consistently excellent and the vegan options plentiful. Read about our previous visit to the cafe here and to the bakery here and here. Since our last visit, Skinny Glutton and The City Lane have visited and loved the bakery. Accessibility: There's a small step up through a narrow-ish entry but everything's more generously spaced once you're in. We ordered and paid at the table, and didn't visit the toilets. Update 27/1/2019: Shebeen has permanently closed down (amid some controversy about how much money actually got donated to any charities). Shebeen opened around nine months ago, but we only twigged to it when their veg options got a mention on Brianna's blog in October. It seems we simply missed the hype - Shebeen has been broadly reviewed by online and offline mags, drawing attention for its not-for-profit structure. Yep, once their operating costs are covered, Shebeen channel all their spare cents to charities across the globe. Their menu goes into deeper detail of this venture than their food and drinks, describing their criteria for selecting charities, ensuring maximum bang for buck, and the excellent work that these groups do. There's still sufficient information about the food, with vegetarian, vegan and gluten-free options patchily marked but dominating the menu. We skipped past the (tempting) snacks and hit both of the gleegan-friendly superfood salads. The organic black bean noodle salad with miso lime dressing and slivered almonds ($12) proved to please Michael much more than I - something about those noodles reminded me of seaweed, and neither the dressing nor the almonds could win me back. The Mexican organic fair trade quinoa salad served with cherry tomato salsa and organic blue corn chips ($12) was a better fit all round. I loved the sour dressing and ripe tomatoes, while Michael unearthed and devoured a chipotle; we bickered over the last couple of chips. Thankfully the veggie banh mi ($10) had already been divided for us. The salad was a little less abundant and pickley than I've had in more traditional versions, but the smoked tofu and pineapple-peanut sauce hit the right, light notes and the bun was crunchy-crusted. We weren't ready for dessert but you should know that they make their own icecreams and sorbets ($4/scoop), and two of the three are vegan! I'm not sure which sounds more fun - the Thai chilli lime sorbet or the choc coconut icy pole. I'm unlikely to be converted to the Jesus Juice (Pepsi and Pinotage). It was great to see Shebeen doing such good business early on a weeknight - the positive, casual setting seemed to attract the quieter after-work drinkers. This bar is built on a laudable premise, but you don't have to feel charitable to enjoy their food and drinks. We first read about Shebeen on Brianna's blog, and it's since been positively reviewed by fellow vego Hayley at Ballroom Blintz. It's also recommended on grazing panda, jouljet and The Owl's Nest. Accessibility: Shebeen has a flat, wide entry and reasonably spaced tables in the front room. There are smoking-permitted stools and tables out front and high stools at the bar. A back room appeared to have well-spaced tables but dim lighting. We ordered and paid at the high bar, then food was brought to our table. Toilets are gendered and located down a flight of stairs. Because Mum gives her annual recipe calendar to Cindy for her birthday, I'm not usually responsible for whipping up any of the dishes. But with Cindy pouring her energy into writing up Shu, I took responsibility for November. The dish of the month was these spinach-cheese puffs. They're possibly the least vegan thing we've made (although this 5 cheese lasagne must go close) - they've got milk, butter, eggs and two kinds of cheese in them. They're very easy to make - melt the butter, stir the rest of the ingredients in and then divvie the mix up into little blobs and bake. The most time consuming part of the process was waiting for the frozen spinach to melt. The end results are little biscuits, with a crunchy exterior and a soft, quiche-like middle. The flavour is really dominated by the gruyere. They're pretty enjoyable - serve with some salad to cut through all the richness. Squeeze the spinach dry in a sieve to get all the water out. Heat the milk in a big saucepan and add the butter and salt. Once the butter has melted and the mixture starts to boil, kill the heat. Stir in the flour and baking powder until the mixture all sticks together and comes off the side of the saucepan. Add the eggs one at a time, stirring them thoroughly into the mixture. After the fourth egg the mixture should be smooth and satiny. Stir in the cheeses and spinach. Lightly spray oil onto two large baking trays and then form the dough into little blobs - roughly a tablespoon in each. You need to leave them a border of a couple of centimetres for baking as they'll expand a bit. Bake for about 20 minutes - they'll start to go golden before the insides are totally cooked, so don't jump the gun. We only let a matter of weeks pass before trying Shu's Wednesday night vegan degustation again, this time joining a table of 20 Vegan Gourmands. The staff were extremely gracious in their service of such a large and motley group. The game has barely changed, though you'll notice that many of the dishes have. On this night, ten shared courses of Sichuan-styled vegan food for the stately sum of $40 per person. It's as seasonal, local and organic as possible. We revisited the fresh daikon rolls, wrapping up enoki mushrooms, tofu, cucumber and fish mint. The bean curd and chive wonton was soft and saucy, with a deceptive wallop of chilli that had me near choking with surprise. The tofu and noodles were more my pace. A raw cucumber salad was pickly but light on the vinegar, with a sesame oil sheen. I was braver for the fresh beans with chilli, a definite spring highlight. These cute cups of mozarella-like silken tofu, house made chilli sauce and crunchy roasted soy beans were a hit across the table. It was many people's first introduction to mouth-tingling Sichuan pepper, and there were rounds of, "Can you feel it yet? You'll know it when you feel it!". I quietly preferred these strips of tender eggplant, also doused in house made chilli then garnished with peanuts and shallots. I know it's difficult to believe, but the fried potato course was even better than last time. Really. My fourth piece might have been the most perfect potato I've ever eaten. I even refused seconds so as not to sully its memory. Beneath the dried chilli threat our penultimate dish offered some impressive bean curd (Michael astutely likened it to Wu Chung mock duck) and crunchy greens, gently infused with the heat. I was thrilled to finish again with Shu's own noodles dressed in walnut infused oil, peanuts and mustard greens, with a pretty floral garnish. It's exciting to eat at a restaurant so responsive to local produce supplies - less than half of this meal resembled our first degustation just six weeks earlier. They may have heeded Michael and Steph's enthusiasm for more spice, as this meal was dressed liberally with chillis and Sichuan peppercorns. But there were other elements to appreciate too - the crunchiest, most vibrant greens, elegant garnishes and the same superlative starches. Shu is really something special. You can read about our previous visit to Shu here. That same meal has since been blogged on Ballroom Blintz, and the above meal has appeared on quinces and kale. Accessibility: There's a small step on entry. The interior is spacious but dimly lit. There's full table service. The toilets are unisex and not too cramped, but there's no specifically accessible toilet. We recently stepped into The Penny Black for the first time, on the recommendation of reader Leah. Though we glimpsed the beer garden out back, it was a rainy night and we crammed into the front room with all their other patrons. It's a grungy live music-hosting pub, with dim lighting and speakers blaring even when there's no gig scheduled. The menu's typical pub fare with gluten-free, vegetarian, vegan and veg-optional items helpfully marked throughout. The veg options are all under $17 and occasionally dive much lower - for example, large pizzas go for just $6 on Tuesdays. The zucchini, fetta, mint and pea fritters ($8.90) weren't as fresh or nuanced as they sounded, crumbly balls of peas and what I took to be spinach (but might've actually been mint), improved enormously by a dab of the sumac labna. We liked the vegan tacos ($9.90) more, rolled up with mushrooms, capsicum, corn salsa and a dairy-free dressing that Leah tells us is cashew cream. The vegie burger ($16.90) was a sprawling hodge-podge of barely-bound pumpkin-lentil pattie, whole roasted mushrooms poised to slip out the side, roasted capsicum, rocket, vegannaise and (I think) hummus on a Turkish-style roll. I concentrated on the accompanying chunky chips, and ran out of puff long before the burger was done. The Penny Black menu seemed a little hit and miss - I'd gladly eat those tacos again and the pizzas I spied at other tables looked pretty good, but the fritters and burger lacked a little lustre. The pub offered more consistency when it came to smiling staff and low prices, so we reckon they're worth a second chance. The broke vego was disappointed by an undersized haloumi burger at The Penny Black last year. Otherwise, omnivorous bloggers have been positive but rarely effusive about this pub; see I talk too much my mouth hurts, Foodscrazy, Where's My Water?, Nick Riewoldt Put Some Clothes On and Parma Daze. Accessibility: There's four steps up on entry, a wide door and then a relatively flat and spacious interior. There seem to be at least two sets of gendered toilets, most accessed by stairs but some at the main level. There was a sign for a unisex disability loo on the main level too. We ordered and paid at a high bar. We keep meaning to revisit Vegan Sandwiches Save the Day. Our first two attempts were complete successes, but the book's downside is its complicated and time-consuming recipes - you really need to set aside an afternoon to churn out these bad boys. Luckily, I had a Sunday afternoon free while Cindy was out and about and decided to have a shot at these seitan and bean sandwiches. Step 1 involves making your own seitan, which takes a bit more than three hours. The book has a beefy seitan version, loaded up with spices and cooked in stock for hours and hours. We went down that road, but any seitan will do the trick. The key to the sandwich is the marinade though - it'll turn whatever meaty substitute you're using into citrussy, boozy deliciousness. Pairing marinated seitan with beans makes these sandwiches a hefty, hearty treat - to be honest I think they'd benefit from a layer of greens or something else fresh and crispy to cut through all the rest. Still - this marinated seitan is likely to be the basis of many of our future sandwiches. Mix up all the marinade ingredients and lay out the seitan strips in it - marinade for about an hour, flipping everything over halfway through. Heat the oil in a decent sized frying pan and fry the seitan for a couple of minutes. Pour over the marinade and fry it up for a few minutes and then flip the seitan and cook for another three minutes or so until the marinade is basically cooked off. In the meantime, get cracking on the beans. Heat the oil in another pan and throw in the onion, garlic and cumin. Stir it all together and cook for a few minutes. Throw in the beans and the reserved marinade - cook on high heat for three minutes, stirring regularly. Mash the beans up into a rough beany mush. Taste and then add salt and pepper necessarily. Assemble the sandwiches: bread, mayo, a thick smear of beans, a few slices of seitan, more mayo and more bread. Done. Our first visit to Maddox was during Vegan Mofo and we were pretty happy with the vegan brekkies they served up for us. We were also quite taken by the range of eggier menu items, so we ventured back on the weekend ready to sample more widely. The main reason we'd come back was the banana-stuffed brioche French toast with sweet labne, winter fruit salad and maple syrup ($16). Cindy had no hesitation in ordering it - there was never really any question. The French toast itself was pretty great - not too eggy, nicely stuffed with sliced banana with some sweet but tangy labne. The fruit salad let the side down a bit though - some of the fruit was bruised, the rhubarb wasn't cooked very well and it was all a bit half-hearted. A bit of a shame given Cindy's enthusiasm for the main piece of the dish - maybe it's time to move onto a spring fruit salad. I went for the buttered eggs on toasted Turkish bread with spiced yoghurt, pink onions, fresh chilli and mint ($13.50). I wasn't really sure what to expect - for some reason I assumed buttered eggs would be scrambled, but they seem to just be eggs fried in butter, with a buttery onion mix on top. Hilariously, in googling to try to find a definition of buttered eggs, I turned up this recipe. Looks pretty familiar. The main thing to note is that they were delicious - a few blobs of tart and spicy yoghurt to cut through the butter, some sweetness from the onions and perfectly cooked eggs. I'd definitely order this again (or maybe just make it at home!). I had a nice coffee, but Cindy's chai never arrived (for which the staff were very apologetic). Sitting at the front table with a brief burst of Melbourne sunshine streaming in, Maddox felt like the best place in Brunswick to be starting the day. There's lots to like about it - the staff are lovely, the cabinets are stuffed with wonderful-looking sweets, sandwiches and other goodies, and the food is pretty good. It's got lots of tough competition in the neighbourhood, but I think Maddox will find its way into our brekkie rotation quite regularly. Nobody else seems to have reviewed Maddox since our first visit. I've enjoyed edamame at Japanese restaurants for many years, but only just picked up a packet to cook at home for the first time. (Thanks to Johanna GGG for pointing out Yahweh Asian Grocery in Carlton as a source.) They proved easy to handle, defrosting quickly, boiling happily, and slipping - shiny and green - from their pods without too much fuss. We plonked them into this noodle salad from Ottolenghi's Plenty. Though the ingredient list is characteristically lengthy, the cooking time is short and the two of us had this sorted in perhaps 20 minutes. I loved the herbs and the lime and tamarind, and ate as many of the fresh red chilli slices as I could stand. 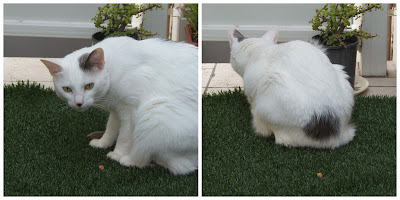 I picked out the larger chunks of galangal, though - it's got a lovely fragrance but I find its flesh a little acrid. I might use ginger next time. We supplemented the salad with a seared mock cod fillet, which had a surprising pungency of its own. Defrost the edamame and set a large saucepan of water on to boil. Boil the edamame for 5 minutes and drain them, reserving the hot water. Place the vermicelli in the saucepan of water for 5 minutes to soften, then drain them. When they're cool enough to handle, pop the edamame from their pods and discard the pods. In small bowl, whisk together the sauce ingredients. Heat the oil in a large frying pan or wok. Add the garlic and white parts of the spring onions, stir-frying for a minute or two, until the garlic just begins to turn golden. Turn off the heat, add the noodles and the sauce, gently stirring everything together. Add the edamame, green beans, remaining spring onions and chilli. Return the pan to the heat for less than a minute, to warm it all through. Add salt, to taste. Stir through the coriander and mint, shake over a little sesame oil and serve. This dinner started kinda backwards, with the side salad - we wanted something fresh and full of avocado so we pulled out the ol' green and gorgeous recipe. From there we needed some extra protein but I wasn't in the mood for tofu. 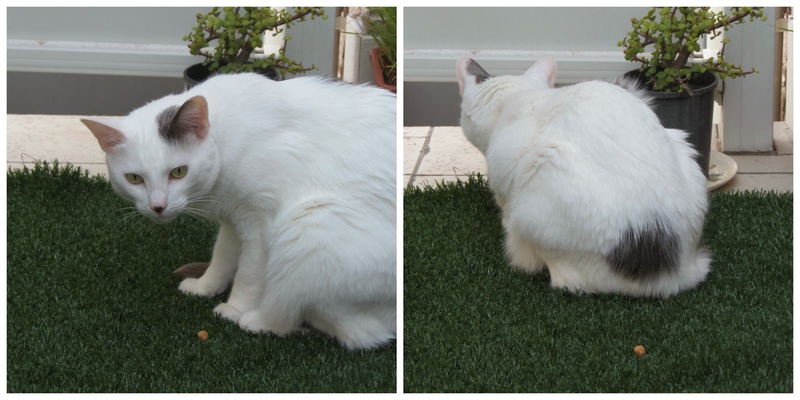 Our housemate Zimbra doesn't concur - though he's been fighting to eat spilled foam beans all week, this stray chickpea didn't even warrant a sniff. Drain and rinse the chickpeas, then transfer them into a bowl. Add the remaining ingredients and stir through, adjusting the flavours to taste. After purchasing our own copy of Vegan Indulgence and recipe testing for Wrapped in Pastry, we were chuffed to be offered an advance copy of Leigh Drew's latest cookbook Veganissimo! Beautiful Vegan Food. 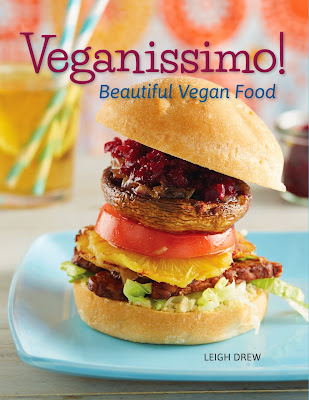 While her previous publications are cute and compact, Veganissimo is a formidable and, yes, beautiful 200-page volume containing 120 recipes. However, Veganissimo doesn't just mutiply the recipe content. Rather, Drew has crafted a well-rounded guide to cooking vegan food at home that should serve as a warm introduction to newbie vegans, the veg-curious and those that cook for them, without condescending to seasoned vegan cooks. She introduces the philosophy and debates around veganism gently and without judgement, and has collaborated with nutritionist Amanda Benham to outline the main nutritional considerations of a vegan diet. Early sections cover basics such as kitchen equipment, pantry staples, legumes, grains and replacements for meat, milk and eggs - all handy shortcuts for those who haven't seasoned a wok, discovered nutritional yeast or soaked their own chickpeas. Of course, the bit I'm most keen on is the recipes. This book aims to deliver at any time and for most whims with sandwiches, soups, salads and sides, heartier main meals, brekkies and baked goods, condiments and desserts, drawing inspiration from a range of cooking traditions. Drew has clearly considered and marked low-fat, soy-free and gluten-free dishes and adaptations. I found Wrapped in Pastry to be labour-intensive, and noticed immediately that Veganissimo offers a variety of quick and simple ideas alongside the more elaborate creations. I really like that Drew has steered away from most processed mock meat and dairy products, calling on beans and nuts for her rich, savoury and creamy elements. Top to bottom, left to right: cucumber and apple raita, baingan bharta, lemon and garlic dal, yeast-free cilantro and garlic naan, tandoori cauliflower cheese and chai coconut icecream. Since we're not shy of elaborating ourselves, we tested out six Veganissimo recipes on friends last week. They were terrific! I was stunned by the yoghurty effect of cashews and lemon in the raita and the tandoori marinade, pleased by a new and nutritious cheese sauce, and foresee the dal becoming a regular winter fallback. Though they were stuffed with curry, I couldn't help noticing that our guests fairly licked their chai coconut icecream bowls clean. sweet cheese borek with rum-soaked raisins. In Veganissimo, Leigh Drew has delivered on an ambitious project - it's informative, should appeal to a broad veg-curious audience, and is just lovely to look at. (Did I mention that it's strewn with gorgeous colour photos and supported by a cheery and unobtrusive design?) Most importantly, she's backed it up with well-thought-out and tasty recipes that are within reach of the home cook. It's Veganomicon with an Aussie sensibility, though I noticed a wee U.S. slant in the book's language - here's hoping it finds success beyond our shores! 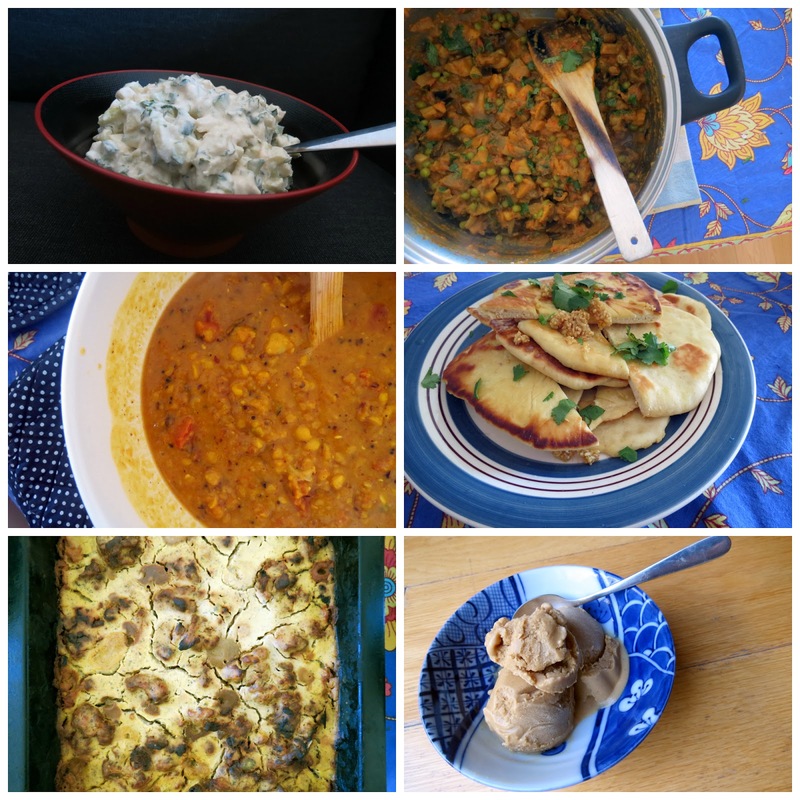 Leigh Drew is also releasing a couple Veganissimo recipes on her blog. Veganissimo retails for $34.99. Look out for it at book stores and health food shops, or purchase a copy online from Arbon Publishing. We received a complimentary copy from the publisher, but the decision to review it and the words and opinions posted are our own. Howler has been on our radar since July, when Fitzroyalty dropped in and gave it the thumbs up. We tried to swing by for a late snack/drink one Saturday night to be confronted by a massive queue which put us off for a while. At a loose end on a Wednesday night we decided to give it another shot. Its address is Dawson Street, but the entry is tucked across a carpark off a dead-end alley. We scrabbled around for a minute trying to find somewhere to lock our bikes up before the dude on the door waved us inside and pointed to the big rack of bike hangers Howler has set up by the door. A good start. Also impressive is the overall style of the place - it's beautifully designed. There's a huge courtyard with dramatic lighting, geometric sculptures and plenty of greenery (although on closer inspection during daylight hours we determined that most of the plants in the courtyard were made of plastic). It also has (at least in the evenings) a DJ pumping loud beats and plenty of smokers, so we wandered through to the room inside. It's just as stunning - they've really poured a lot of energy into making this place look amazing. The nighttime vibe is as much nightclub as restaurant - conversation requires a raised voice and the lighting did our photography no favours at all. In fact, the photos were so mediocre that we decided to head back in the daytime and try again. On a sunny Sunday the vibe is much more pleasant - the music's turned down, the crowds have dispersed a bit and you can see what you're doing (yes, okay, we're old). The menu is a single page of small dishes: spring rolls, bao, dumplings and salads ($8 each) plus a few snacks (nuts, pickles, edamame, $5), plus some brunch specials during the daytime (omelettes and wraps, $9.50 a pop). It's very veg-friendly as well - all four salads seem vegan, and they've got veggie dishes dotted throughout the rest of the menu as well. We sampled widely, starting with the shichimi spiced vidalia onion rings with a mustard miso mayo ($8). I'm going to let the picture do the talking here - incredible. Next up, the tofu and kim chi dumplings ($8, probably vegan) - you have the choice of steamed or fried, but we chose fried on both visits. I quite liked them, especially dunked into the soy and chilli sauce condiments they came with. The filling is pretty unrecognisable as tofu and kim chi though - it's a kind of paste, with a fairly mild flavour. Cindy wasn't really won over by them. Met with more universal acclaim were the bao pillows filled with crispy tofu, bean shoots, coriander, pickled ginger, beetroot relish and wasabi kewpie mayo ($8, probably not vegan - definitely not the mayo anyway). These were a nice combo of light, fresh flavours and the fried crispy tofu chunks, all wrapped in a soft puffy dough. Maybe not quite up to those we had at East Elevation, but pretty good nonetheless. The only thing we changed between visits was our salad of choice. On the evening trip we had the brussel sprout kim chi with basil, candied cashews and fried red onion ($8). I really liked this - a nice mix of sweet and spicy flavours and a bit of crunch from the cashews. On our second trip we went with the spring bean salad with sweet herbs, spring onion, snowbean tendrils and a lime and peanut dressing ($8). This was a solid effort as well - lots of fresh, crunchy greens and a mild dressing - I'd probably up the lime a bit if I was in the kitchen, and maybe sprinkle on some chilli flakes, but I wouldn't have had the patience to make the great snow pea tendrils, so it's a a trade-off really. Howler is a nice addition to Brunswick - the courtyard is a lovely, sunny space during the daytime and the whole venue is very stylish. The food is decent and pretty reasonably priced, there's a great array of drinks and a couple of performance spaces tucked somewhere out the back. Well worth a visit. For all Howler's hipness, only Fitzroyalty and Melbourne Mademoiselle seem to have blogged about it so far. Accessibility: Pretty good. There's a flat entry way into a spacious courtyard and no steps as you go through to the inside area. The toilets are on the same level and there's wheelchair accessible and unisex facilities. Ordering and payment is at the bar.